Never thought I would step into this place as I had visited the Shibuya outlet years ago. But the possibility of something new and different in the Singapore outlet prompted a visit this place with my good friends. The first thing that came to my mind was "This broth tasted like the spicy-sour instant noodles I've had at home". This shouldn't be the case, at least for my first bowl at the highly popular Afuri. I dropped by the Harajuku outlet which was surprisingly quite "high-class" and luckily not kitschy. Heard about this super yummy gelato shop that is rated number one on Tabelog. Located in the sleepy town of Yutenji just a walk away from the station, this Italian gelataria occupies half a unit and it blends so well into the surroundings that you may miss it easily. The place doesn't set you in a bright and cheery mode like those colorful ice cream parlour as it is dimly lit with a brownish red interior. You can't see any gelato at all as they are covered in the metal tins like what a proper gelato shop would do. I love fish. Not so much of raw sashimi but cooked ones especially those baked or grilled. And you can imagine my excitement when I found out about Suzunami, a retail shop that specializes in Japanese marinated fish. It has a restaurant space at Tokyo Midtown where one can have a taste of their unique fish that are marinated with mirin kasu (味淋粕). Mirin Kasu refers to solids left after steamed short-grain rice is fermented with rice koji (rice malt) and shochu for the sweet alcoholic liquid known as Mirin, an indispensable ingredient that is used in Japanese cooking. Suzunami takes pride in adopting the traditional Daiwa-ya style of fermenting technique from Nagoya to produce its unique "Gyokai Mirin Kasu" (魚介味醂粕). The fermentation process is made with premium Niigata rice and the result is clumps of white less that imparts a nice subtle booze to the fish. The all-day menu is short and precise. There are 7-8 rice sets to choose from, each comes with rice, the fish of the day, dark red miso soup. The Suzunami Set (¥1296) was served with a big bowl of pork radish broth that was sweet and robust. The fish might look like any other grilled fish outside but they have more depth and complexity in sweetness, jazzed up by a mellow alcohol fragrance. Miso has been mixed with the mirin kasu during the marination process, drawing the umami essence from the fish instead drowning them in flat saltiness. If you want to go light on carbs (which is not a good idea since the rice itself is SO tasty) and more on the fish, you can have a set to share with a partner and order other kinds of fish from the ala carte menu. I appreciated that these sets rose above the typical Japanese rice meal with interesting additions like the sticky pool of Tororo, delicious grated yam that pairs superbly with warm rice, as well as chicken wings or the rice bowl that is topped with half minced chicken and half grated egg yolk. Towards the end, diners will be served a shooter of Ume-kazu vinegar to cleanse the palate. This is made by adding vinegar bacterium (酢酸) to sake kasu (酒粕), which is the by-product of fermentation stretching longer than average for 3 years. Plum juice is mixed in to neutralize the acidity, resulting in a sweet and tangy drink to complete the wonderful healthy meal. Right outside the entrance is the retail booth that display their mirin kasu products and all kinds of marinated that are good for takeaway or as gifts. This wasn't a place on my list this time but I'm glad to have given it a try. Having fish is good but having delicious, high-quality fish is even better. When one speaks of patisseries in Yoyogi, there are always two popular names; one is Asterisque and the other is Bien-Entre. It's famous for its monthly-changing parfaits and the flavor for June happened to be the Shincha Parfait 新茶パフェ. It comes right at the perfect timing since June is the usual month when "新茶" meaning "new tea" or the first batch of tea for the year is harvested. The time of harvest does vary for different location and can start as early as April in regions like Kagoshima or Shizuoka. Besides having Marshmallows in Smores or Chocolate Fondue, how about having them on pancakes? Accueil Pancakes is one of the "older generation" pancakes house that was rated Japan's No.1 Pancake. Its main Ebisu outlet recently undergone a renewal and there's another in Yokohama. It also runs a same name cake cafe called Patisserie Accueil, located a distance away in Ebisu. The cakes are available as well in the pancake shop but Accueil's cult following is still built around pancakes which are available in both savoury and sweet versions. Made a detour to this ramen-ya after a failed dinner plan at a popular izakaya which reeked of tobacco rather than food. A quick Tabelog check revealed a rather average rating but still there was a steady stream of students and salarymen strolling into the shop. And so I took a gamble and ordered a seasonal bowl of Spicy Tan Tan Ramen (¥900) which looked excitingly fiery and red on the signboard. Doesn't a piping hot Camembert Cheese Tart sound like the perfect dessert for any cheese lovers? This tart is exclusively available at Pablo Cafe Omotesando outlet (actually much nearer to Harajuku station), which is designated as one of the two premium cafe besides the one at Dontonburi outlet. The cubes of Camembert was intensely strong in the umami taste and there's one ingredient which you would least expect here. Black Pepper. ZAKU ZAKU by BAKE Cheese : Next HOT item? A reader sent me a message to check out "Zaku Zaku" a few months ago and I finally got the chance to do so when I happened to pass by Harajuku the other day. The hot-selling item is a Chou Croquant shaped like a long eclair or some might say, churros. Piped with fresh custard upon order, the lightly crisp pastry shell coated with almonds gave off a blissful "Zaku Zaku" sound when you bite into it. Lunch doesn't come cheap in the CBD area and so it was quite an occasional luxury to be able to dine at Jin Fine Dining Japanese Restaurant. Lunch sets start from $23++, which typically comprises of a salad, rice, if you are really prepared to indulge in the premium ingredients, be prepared to pay as much as $62 for the premium wagyu bowl. From cronuts to scookies, the trend of hybrid sweets has been going hot and strong despite the varying response from consumers. Some make it and some fail. Jumping on this hybrid sweets bandwagon is "chouxcream chouxcri", a takeaway shop in JR Ikebukuro station that sells a unique pastry that combines the essence of choux and croissant. The popularity of cream puffs, commonly known as "Chou" (pronounced as "shoe" as the French spelling "choux") in Japan, has never cease to fade and one can find good ones easily in convenience stores and patisseries boutique. Opened since late May 2015, this shop sells three types of items and one seasonal flavor. The ChouxCri (¥290) is a chewy mochi-like choux pastry encased with a thin layer of macaron shell. The pastry framework is much firmer than that of Beard Papa and could hold the cream very well. Nonetheless, I prefer the ChouxCroissant (¥290), the same choux pastry base with a croissant shell, which is easily identifiable with its distinct golden swirls on top. It might not be as ultra-crispy as a fresh croissant due to the filling, but there was no hints of sogginess even leaving it overnight (that is if you can even resist not having it immediately). There's still a significant crunch and buttery aroma in the pastry, contrasting perfectly with the generous amount of fragrant vanilla cream. To me, this ingenious creation beats the Cronut in all ways; an amazing dream come true for me who loves both croissants and cream puffs. However, the seasonal flavor, Chocolate, was awry and weak, failing to boost the satisfaction like what the original flavor did. But this won't stop me from trying other flavors next time. Perhaps in time to come, I shall challenge their Chou Grande (¥1400), the ultimate jumbo-sized choux filled with rare cheese and lime cream. 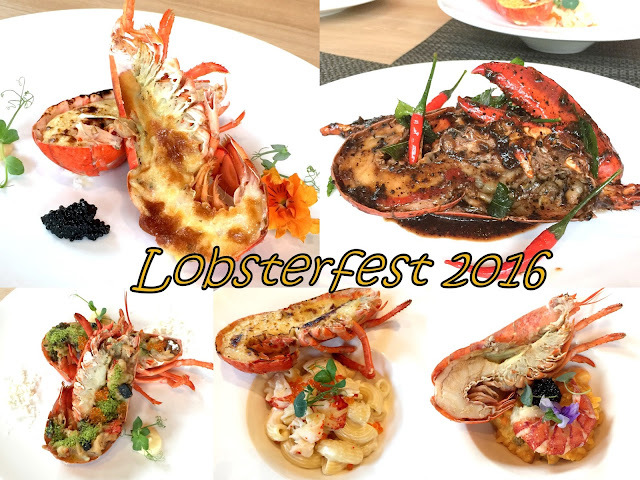 Lobsterfest 2016 @ Lime Restaurant at PARKROYAL on Pickering : MUST TRY Buffet for Lobsters Lovers is BACK! Remember the popular SG50 Lobsterfest last year at PARKROYAL on Pickering? It is back in full force with new additions that are worth putting aside your diet plans!! Can you hear my wallet crying? This is by far the most expensive coffee break I've had at a hakwer center. Run by young hawkerpreneus, this stall stands out from the crowd by offering more than just traditional kopi and toasts. The selection of earl grey cream, black sesame and cinnamon sugar is by no means, creative and appealing. On the drinks side, there's latte or chocolate with funky add-on like rum, salted caramel or even coffee with taro milk.